pride of ownership resonates as you walk through the front door of this beautifully updated and well maintained home. the main level offers a warm and inviting dcor, new and professionally installed hardwood flooring and brand new kitchen, complimented by a stunning back splash. you will also find 3 bedrooms and a lovely updated main full bath. fully finished lower level offers a second updated full bath, generous laundry room, storage area and massive rec-room/workout space with a fantastic wet bar great for entertaining friends and family. 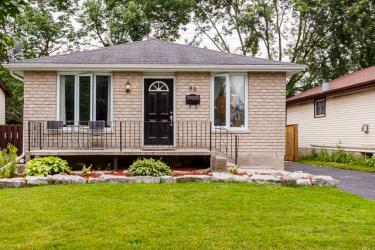 after a hard days work relax and unwind by sitting in the privacy of your fully fenced back yard, on your wrap around limestone patio while taking in the lovely landscape. you will not want to miss out on the opportunity of this stunning home situated on a quiet, tree lined street with convenient central location, close to all amenities including cfb kingston. this home is complete, with no detail untouched and ready for you to move in and enjoy.